Celtic Knotwork with Butterflies, Birds and Beasties for Quilts. The nearest thing to instant original Celtic knot work designs you can find. A large pull out sheet provides sections of ready drafted design which can be cut apart joined together to create endless alternative arrangements to suit any type or size project. 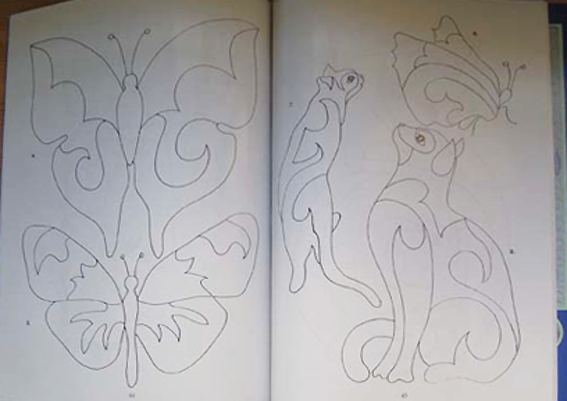 The book also contains 64 patterns for birds, butterflies and 'beasties' which can be used alone or in conjunction with the Celtic designs. Easy to follow step by step pictures lead you through the classy raw edged appliqué technique. These animals are an updated version of the mythical creatures ( ' zoomorphics') found in original Celtic manuscripts. The endless possibilities this technique provides for "freeform' Celtic design allows the designer the choice of traditional; or very modern interpretations.